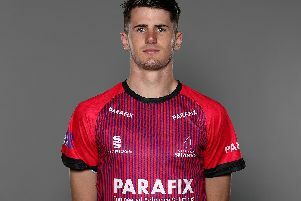 Brilliant hitting from Ryan Higgins, who took 24 runs from a final over bowled by Ajmal Shahzad to end on 48 not out from only 23 balls, propelled Middlesex to a challenging 50-over total of 341 for 5 against Sussex at Lord’s. Bad weather, however, arrived with Sussex 26 for 1 from four overs in reply, meaning that the Royal London One-Day Cup match was eventually declared a No Result – with both teams taking one point each – and that ultimately the considerable combined efforts of Higgins, Middlesex opener Paul Stirling and their fifth wicket pair John Simpson and James Franklin were in vain. Ireland international Stirling’s 71 from 60 balls provided the initial impetus, before Simpson and Middlesex captain Franklin steadied things following a mini-slide to 146 for 4 with a perfectly-paced century stand. Stirling hit a six and nine fours and Adam Voges also scored a useful 40, but it was Franklin, in a 117-run partnership with Simpson in 16.4 overs, who began the late assault against Sussex’s bowlers by clubbing five sixes and three fours in his 69 from 60 balls. Franklin and Simpson, who finished on an unbeaten 82 from 80 balls, built their stand carefully at first as Sussex spinners Will Beer and Danny Briggs regained some sort of mid-innings control for their side in excellent 10-over spells. But Franklin, who did swing leg spinner Beer for the first of his sixes, cut loose when the seamers returned for the last phase of the innings and took a heavy toll of Jofra Archer, David Wiese and Shahzad, who he pulled twice for sixes in the same over in which he was bowled aiming another big hit. Simpson and Higgins, who flat-batted Wiese over cover and also straight-drove and pulled the suffering Shahzad for sixes in his explosive knock, hit out so strongly in the final overs that their unbroken stand of 78 took a mere 6.3 overs. Higgins struck three fours off Shahzad as well as those two sixes in the eye-catching 50th over, and four fours in all, while Simpson included eight fours in his expertly-judged innings. Sussex’s reply began with Chris Nash taking an immediate liking to Steven Finn, with two legside fours in an opening over costing ten and then a pulled six and two further fours in Finn’s second over, which went for 14 runs. In between, however, Tom Helm produced a fine outswinger with his first ball of the innings to have Luke Wright caught at the wicket for a first ball duck and the 23-year old England Lions fast bowler certainly impressed in the two overs he bowled at a cost of just one run – as well as the prized scalp of Wright – before the rain came. Middlesex head coach Richard Scott said: “Because we missed the first round of County Championship games this competition has come upon us all of a sudden but squad-wise I think are looking strong. “I think we have played some really good List A cricket in the last few years. We have used quite a few players so there is lots of experience of white-ball cricket in the squad and I’m really pleased with where we are it.